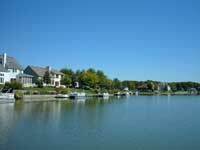 The 67 acre private Hidden Harbour Lake provides a unique atmosphere to the community. It is the site of year round activities including boating, fishing and swimming in the warmer months to ice fishing and ice hockey in the winter. The residents enjoy cruising on pontoon boats, sail boats, windsurf boards, paddleboats, canoes and kayaks. Gasoline powered watercrafts are not allowed, ensuring a safe and peaceful environment for residents and wildlife. The clean waters form the ideal habitat for many species of fish, in particular largemouth bass, crappies, bluegills, carp and catfish. The western side of the lake, known as the “Baja”, is a long stretch of unconstructed natural land with a wide range of trees and plants native to Northern Ohio. This is a private gated area with two sandy beaches for the enjoyment of the residents. The lake is also the rest area of many breeds of bird and waterfowl during the migration season.